The web browser is arguably the most utilized software on any given endpoint. The browser has evolved into a feature-rich tool used to consume & create content of all kinds, conduct financial transactions, access sensitive health care information -- you name an application and data type and someone has a browser based solution. Browsers are also the least managed software in the enterprise. Most IT shops have abdicated control of the browser. 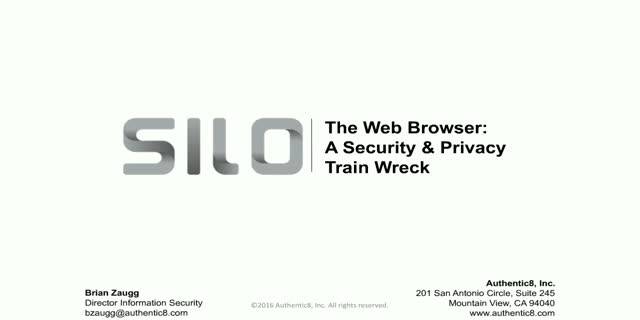 Bolt-on browser security solutions, like proxies and application firewalls, rest on the enterprise perimeter and, in our mobile BYOD world, ultimately still leave the endpoint, the user, and the user's data exposed. There is a natural tension between the browser, enterprise IT security, and privacy. The browser exposes the user and the user's data to both security and privacy risks. Security and privacy objectives may overlap; but, they are just as often at odds. For example, most enterprises conduct content inspection and blocking of user browsing activity; few enterprises encourage or allow a user to take advantage of TOR and other anonymization and privacy technologies. Meanwhile, enterprise and user confidential data is the treasure that bad guys are hunting.